At PCE Instruments you will find a salt meter to measure salt content. With different models in our salt meter range you can measure salt content following the direct method with the help of the optical refractometer, or determine salt content following the indirect method by means of a conductivity meter. The salt meter is suitable for measuring salt contents in aqueous solutions or viscous media. We recommend using the refractometer to measure sea water or solutions with high salt content. With the indirect method you will obtain the conductivity value which will proportionally increase with the salt content. You can choose between a salt meter for flowing or pure water (it is important for certain industries). 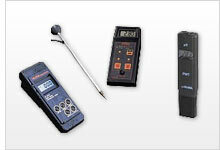 We offer a salt meter with different conductivity measurement fields. It is important to know that a salt meter usually emits electric conductivity as a measurement value in µS/cm. The salt meter PCE-PWT 10 is a good solution for anyone who wants to check the conductivity of ultrapure water and to accurately determine the salinity of liquids. Salt meter for EC and TDS (amount of salts and dissolved solid materials). Auto ranges up to 20,000 PPM. Salt Meter to determine salt content in liquids. The salt meter PCE-SM 11 measures conductivity in non-saturated solutions quickly and accurately. The Conductivity Meter PCE-SM 11 has a high measuring accuracy thanks to the automatic temperature compensation.